Windows Phone 7 to Launch on October 21st ! First of AT&T Ads Hits the Web ! Neowin has received information that Microsoft is set to launch a wide range of Windows Phone 7 devices on October 21 in UK, France, Germany, Italy and Spain (US 21st Oct release date is not confirmed yet). With Windows Phone 7’s launch date inching nearer and nearer day by day, the time has come for Microsoft to start making use of its $400 million advertising budget for their all-new overhauled mobile operating system! From what information we have, the ads embedded below were leaked from Microsoft. Original ads were pulled down but WMPoweruser managed to download a copy of the ads and uploaded them from their own account. See them in all their glory below! 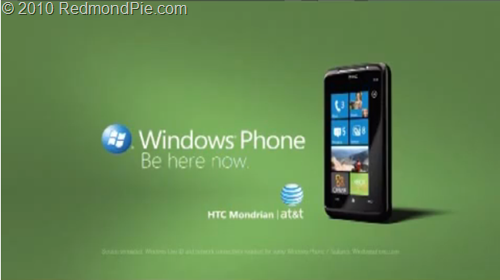 At the end of both ads, you can see the HTC Mondrian. It is a WP7-based smartphone and from what we can tell, it will have a 1GHz processor, 512MB of RAM, a 5MP camera w/ flash, 8GB flash memory, WiFi, Bluetooth and the other standard WP7 specs. Screen size is not confirmed at the moment, but it should be 3.7” since HTC will keep the 4.3” spot for HTC HD7. Microsoft Celebrates Windows Phone 7 RTM with a Funeral Parade for the iPhone ! On of my pal just found out this from one of the uｎｌｏｃｋ blogs that most of the uｎｌｏｃｋ providers are deleivering very unsafe uｎｌｏｃｋing solutions causing virtually all the phones to be bricked in a very short period of time. When you factory uｎｌｏｃｋ your phone use a a skilled factory uｎｌｏｃｋ team like ATTIPHONEuｎｌｏｃｋING or official>iphoneuｎｌｏｃｋing. just google atttiphoneuunloockiingcan սոⅼοсking any At&T phones in only 6 days. Their facebook is also great! !